A New and Accurate Map of the Netherlands or Low Countries. 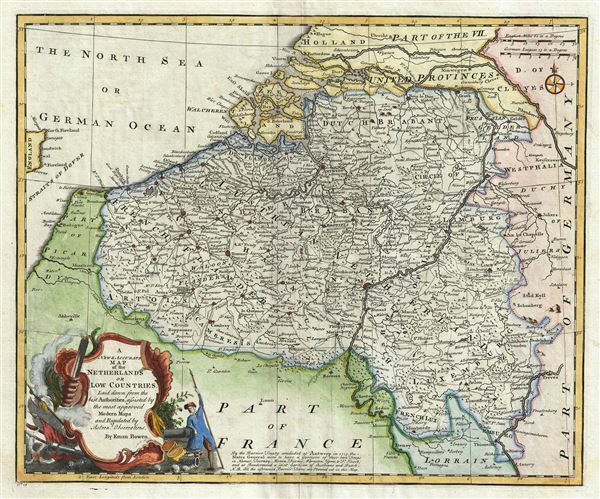 This is a beautiful 1747 map of Belgium by the British cartographer Emanuel Bowen. The map depicts Belgium and Luxembourg along with parts of Germany, France and Holland. The map notes several towns, cities, rivers, lakes, roads and a host of additional topographical features. Mountains are beautifully rendered in profile. During this time, following the War of Spanish Succession, much of Spanish Netherlands (which included modern day Belgium and Luxembourg) was ceded to Austria and the region began to be known as Austrian Netherlands. In 1794, Austrian Netherlands became part of France and later, in 1815, became part of the United Kingdom of Netherlands. Eventually, the 1830 Belgian Revolution would create the modern Belgian state. The map includes a note near the bottom margin referencing the third Barrier Treaty of 1715 signed in Antwerp. A beautifully illustrated title cartouche featuring a cannoneer is included the lower left quadrant. This map was prepared by Emanuel Bowen as plate no. 13 for the 1747 issue ofÂ A Complete System of Geography. Emanuel Bowen (1694 - May 8, 1767) had the high distinction to be named Royal Mapmaker to both to King George II of England and Louis XV of France. Bowen was born in Talley, Carmarthen, Wales, to a distinguished but not noble family. He apprenticed to Charles Price, Merchant Taylor, from 1709. He was admitted to the Merchant Taylors Livery Company on October 3, 1716, but had been active in London from about 1714. A early as 1726 he was noted as one of the leading London engravers. Bowen is highly regarded for producing some of the largest, most detailed, most accurate and most attractive maps of his era. He is known to have worked with most British cartographic figures of the period including Herman Moll and John Owen. Among his multiple apprentices, the most notable were Thomas Kitchin, Thomas Jeffreys, and John Lodge. Another apprentice, John Oakman (1748 - 1793) who had an affair with and eventually married, Bowen's daughter. Other Bowen apprentices include Thomas Buss, John Pryer, Samuel Lyne, his son Thomas Bowen, and William Fowler. Despite Despite achieving peer respect, renown, and royal patronage, Bowen, like many cartographers, died in poverty. Upon Emanuel Bowen's death, his cartographic work was taken over by his son, Thomas Bowen (1733 - 1790) who also died in poverty. Bowen, E., A Complete System of Geography. Being a description of all the countries, islands, cities, chief towns, harbours, lakes, and rivers, mountains, mines, etc., of the known world …, (London) 1747. Very good. Original platemark visible. Minor wear along original centerfold. Rumsey 3733.012. Philips (atlases) 614 (1752 edition).